You know what they say… An apple a day keeps the doctor away! Candy coated apples are one of those treats I don’t get why we typically only make once a year. Simple to make, and delicious sounds like a perfect combo for a year-round treat if you ask me. 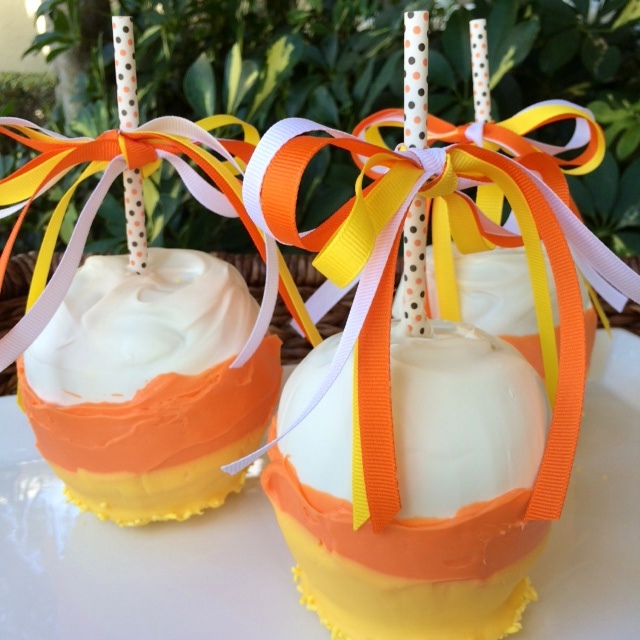 Dipped to look like the festive Halloween sweet, Candy Corn these chocolate coated apples are sure to add a bit of sweetness to your up coming Halloween party. Line a baking sheet with parchment paper. Insert dowels into tops of the apples where stems used to be. In a heat-safe 4-cup glass measuring cup, or a medium glass bowl, melt white candy melts in the microwave, stirring halfway through, 1 to 2 min. Holding an apple by its stick, dip into melted candy and turn to coat apple completely. Remove, turning to let excess drip off. Place on prepared sheet. Repeat with remaining apples. Let apples stand until candy is firm, about 15 min. Melt orange candy melts in another glass measuring cup or bowl. Dip an apple two-thirds of the way into melted candy. Remove and let excess drip off. Return to prepared sheet. Repeat with remaining apples. Let stand until candy is firm, about 15 min. Pour yellow sugar into a shallow bowl. Melt yellow candy melts in another glass measuring cup or bowl. Dip an apple one-third of the way into melted candy. Remove and let excess drip off. Dip apple into yellow sugar to coat. Return to prepared sheet. Repeat with remaining apples. Let stand until candy is firm, about 15 min.